Your coccyx, or tailbone, is an integral part of your vertebral column. It serves as a vital attachment point for your ligaments, tendons, and muscles. The coccyx is also useful for stabilizing you while in a seated position. Your tailbone is a triangular structure of bone at the base of your vertebral column and is also a major insertion site for some of your muscles which are a part of the pelvic floor. If this part of your body suffers from illness or injury, then it can present some serious challenges. We will discuss very brief about coccyx injury in this message. 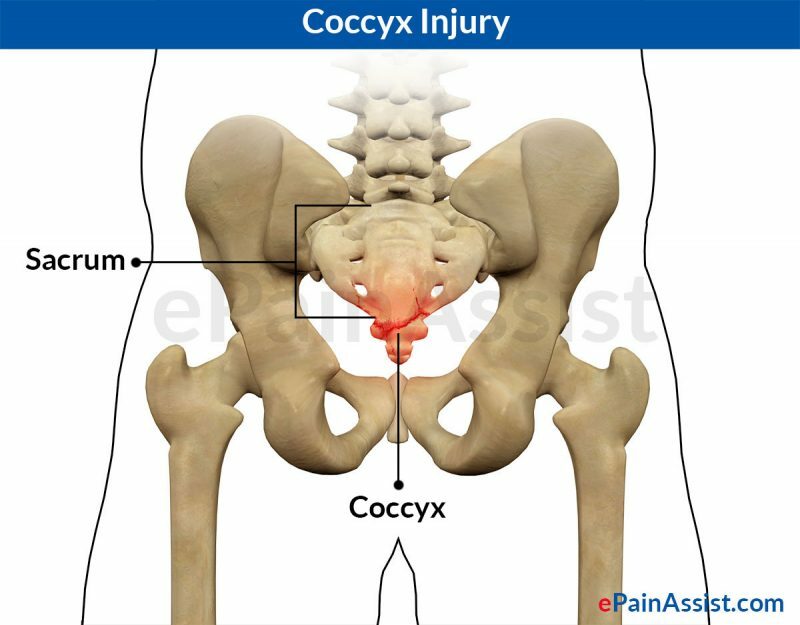 If your coccyx is subject to trauma then it may result in pain and/or discomfort. This medical condition is referred to as coccydynia. The types of injury that may affect this area of your body include bruising, fracture, or even dislocation. Injury to your coccyx can require a lengthy period of time to heal, but you can assist with this process by managing it through careful treatment. Your body’s natural response to an injury is almost always going to be some swelling, heat, and redness. This is a result of fluids such as blood moving into the affected area in an effort to start the healing process. The pain experienced during an injury is most likely the result of compression of your nerves in the area. Since pain is the way that your body communicates with your brain to alert you to the damage to tissues, it can often be an effective tool for your body to prevent further injury. This is a result of your response to the pain. Usually, when there is significant pain, you will avoid using the body part where the pain is sensed. Ayurveda is a holistic approach to dealing with imbalances in your body. Through an understanding of the doshas that directly impact your overall health, you can find balance. A basic understanding of your doshas and how they affect the efficiency of your body can go a long way. In Ayurveda, both the management and treatment of injury are based upon the qualities of the imbalances present in your body. These imbalances relate to your doshas. The three doshas are Pitta, Vata, and Kapha. When one dosha is out of balance, it can have a serious effect on your body. An injury can cause a severe imbalance in your body. Inspecting the relationship between your body and doshas can help to reduce the effects of an injury. Impairment of your doshas will occur after an injury. Vata imbalance can cause swelling and pain. Dealing with this imbalance can be an effective way to treat the injury and promote equilibrium. When balancing your Vata you may want to try a more Vata-pacifying diet. This includes foods that are cooked and warm such as stews, hot cereal, soup, and hearty grains. It is important that you try to stick to sweet, salty, and sour tastes while avoiding pungent, astringent, and bitter foods. Dairy products can also help to pacify your Vata. You may also find that fats and oils are beneficial to balancing Vata by way of your digestive system. Pain and/or discomfort resulting from an injury to your tailbone may be difficult to treat cautiously since it is such a sensitive area of your body. There are a couple of simple steps that you can take to treat a coccyx injury at home. Cushioning the coccyx and surrounding area can go a long way in helping your body through the healing process and still allow you to sit comfortably with the proper support for your spine. This can also make any necessary travel during this period of time easier. The best seat cushion should take the pressure off of your tailbone. This should make any sitting that you have to do much more comfortable. These cushions can also help promote good posture which should help reduce common hip and back issues. The R.I.C.E. method can significantly help aid your body in healing from an injury. This technique for self-care includes rest, ice, compression, and elevation. Rest the injured area for a couple of days to give your body the time to deal with the damage. Icing an injury can help reduce pain and swelling. Compression also helps reduce swelling. Elevation of the injured area above the level of your heart will help keep the swelling down while you are resting.